This was the day rock turned to Rubble - the end of an era for generations of rock, pop and soul music. Dunstable's famous California entertainment centre, which brought top stars to the town for 20 years and closed its doors on New Year's Day has begun to bite the dust. 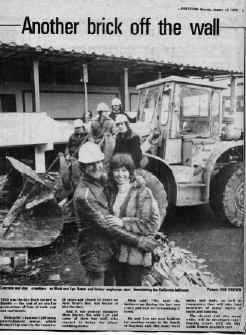 And it was general manager Mick Rutter, his wife Lyn and some of their staff, who started to bring the place tumbling down. Mick said: "We built the business up during the last two years and now we're knocking it down." He and Lyn are now looking for another venue in the South of England and, like many local mums and dads, as well as youngsters, they will take fond memories of many nights of music and dancing. The six-acre Cali site meanwhile, will be developed into a housing estate with the Dunstable Downs as a backyard. The California Leisure Complex may be demolished to make way for a housing estate. Details were released this week of plans to build 37 luxury homes on some of the California land at the foot of the Dunstable Downs. And if they are passed by the South Beds Council's planning committee, the complex, one of the country's major entertainment centres, may go. Miss Diana Wickson, chairman of the planning committee and representative of the Whipsnade Road area, said she believes the scheme is the "final solution" to problems that have beset local residents. Miss Wickson said: "I believe the committee will support the application. The site has been a problem for a great many years. The place is not a going concern any more - it is a nuisance. Youngsters do not go there in large numbers any more. They have found other places to go. The California is not a particularly pleasant place to look at. Houses on the site would be most welcome to all concerned." One resident living opposite the California who did not wish to be named, said about the plans: "It's like a prayer come true. We have waited for 18 years for something to be done - it is like a miracle. I have nothing against the California - it is not too bad to look at. It is the people that go there - rowdyism, swearing, fighting. They damage our cars and wake us up at 2am." Another resident added: "When they come out of concerts they rampage through our gardens. If they build houses all the suffering will be over." Five months ago California owner Mr Bill Seymour put the site up for sale but he told the Gazette at the time that it was for valuation purposes. The planning application has been submitted by a Luton - based company - Dallas Developments Ltd. The Ballroom has been the major centre for music Groups like the Rolling Stones, The Beatles* and The Who have appeared there. NB. 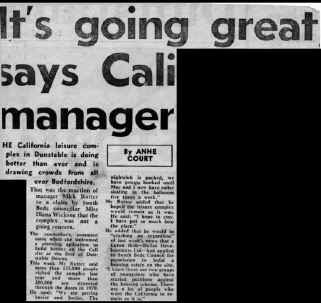 The Beatles never played at the California. They were double booked and played in Luton instead. The California leisure complex in Dunstable is doing better than ever and is drawing crowds from all over Bedfordshire. That was the reaction of manager Mick Rutter to a claim by South Beds Councillor Miss Diana Wickson that the complex was not a going concern. The councillor's comment came when she welcomed a planning application to build houses on the Cali site at the foot of the Dunstable Downs. This week Mr Rutter said more than 135,000 people visited the complex last year and more than 200,000 are expected through the doors in 1979. He said "We are getting busier and busier. The nightclub is packed, we have groups booked until May and I now have roller skating in the ballroom five times a week." Mr Rutter added that he would be "crashing on regardless" of last week's news that a Luton firm - Dallas Developments Ltd - had applied to South Beds Council for permission to build a housing estate on the site. "I know there are two groups of youngsters who have started petitions against the housing scheme. There are a lot of people who want the California to remain as it is." May I first thank you for your kind invitation to attend a "Residents' Night" at Didoz. We came out of curiosity - having in the past been disturbed many times by your predecessor's customers. I must now admit that my wife and I thoroughly enjoyed our evening out. The Club staff were more than friendly and helpful. The music very tasteful - not too loud! One could talk with ease - still enjoying the music when dancing, and the interior decor very restful. My one regret was that more of the people who live in the area of "Didoz" and who received your offer of a good cheap evening out did not accept your hospitality which we whole heartedly enjoyed. 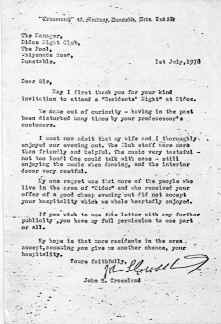 If you wish to use this letter with any further publicity, you have my full permission to use part or all. My hope is that more residents in the area accept, assuming you give us another chance, your hospitality. 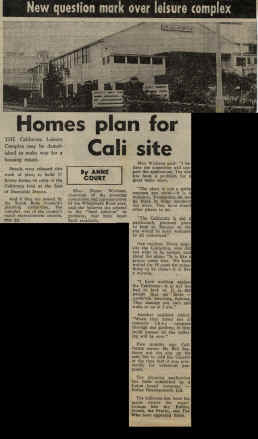 Having read through a considerable amount of information on the activities of the Planning Committee and in particular Miss Diana Wickson, it would seem that there was a determination to close the California Ballroom regardless of the thoughts of the people of Dunstable and regardless of the effects on the teenage population. Miss Wickson lived down the road from the Ballroom and was, I'm told by a resident of Piper's Croft, constantly going round with petitions to have the place closed. Once she had become a member of the planning committee, the California's fate was all but sealed. What really rankles is that she must have known that the California was there when she bought her house. Let's face it, it was big enough for her not to have missed it.